In general there is no such thing as plug-n-play security. Security depends on the people using the framework, and sometimes on the development method. And it depends on all layers of a web application environment: The back-end storage, the web server, and the web application itself (and possibly other layers or applications). The threats against web applications include user account hijacking, bypass of access control, reading or modifying sensitive data, or presenting fraudulent content. Or an attacker might be able to install a Trojan horse program or unsolicited e-mail sending software, aim at financial enrichment, or cause brand name damage by modifying company resources. In order to prevent attacks, minimize their impact and remove points of attack, first of all, you have to fully understand the attack methods in order to find the correct countermeasures. That is what this guide aims at. In order to develop secure web applications you have to keep up to date on all layers and know your enemies. To keep up to date subscribe to security mailing lists, read security blogs, and make updating and security checks a habit (check the Additional Resources chapter). It is done manually because that's how you find the nasty logical security problems. This chapter describes some particular attacks related to sessions, and security measures to protect your session data. 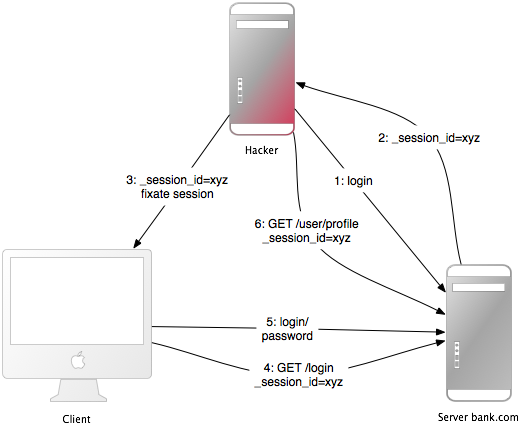 Sessions enable the application to maintain user-specific state, while users interact with the application. For example, sessions allow users to authenticate once and remain signed in for future requests. Most applications need to keep track of state for users that interact with the application. This could be the contents of a shopping basket, or the user id of the currently logged in user. This kind of user-specific state can be stored in the session. Rails provides a session object for each user that accesses the application. If the user already has an active session, Rails uses the existing session. Otherwise a new session is created. Read more about sessions and how to use them in Action Controller Overview Guide. The main objective of most attackers is to make money. The underground prices for stolen bank login accounts range from 0.5%-10% of account balance, $0.5-$30 for credit card numbers ($20-$60 with full details), $0.1-$1.5 for identities (Name, SSN & DOB), $20-$50 for retailer accounts, and $6-$10 for cloud service provider accounts, according to the Symantec Internet Security Threat Report (2017). Rails uses ActionDispatch::Session::CookieStore as the default session storage. Learn more about other session storages in Action Controller Overview Guide. Cookies are stored on the client-side. The client may preserve cookie contents even for expired cookies. The client may copy cookies to other machines. Avoid storing sensitive data in cookies. Cookies are temporary by nature. The server can set expiration time for the cookie, but the client may delete the cookie and its contents before that. Persist all data that is of more permanent nature on the server side. Rails encrypts cookies by default. The client cannot read or edit the contents of the cookie, without breaking encryption. If you take appropriate care of your secrets, you can consider your cookies to be generally secured. Secrets must be long and random. Use rails secret to get new unique secrets. If your application's secrets may have been exposed, strongly consider changing them. Changing secret_key_base will expire currently active sessions. Sessions that never expire extend the time-frame for attacks such as cross-site request forgery (CSRF), session hijacking, and session fixation. It is important to notice that the actual crafted image or link doesn't necessarily have to be situated in the web application's domain, it can be anywhere - in a forum, blog post, or email. If your web application is RESTful, you might be used to additional HTTP verbs, such as PATCH, PUT, or DELETE. Some legacy web browsers, however, do not support them - only GET and POST. Rails uses a hidden _method field to handle these cases. If it is at the end of the URL it will hardly be noticed and redirects the user to the attacker.com host. A simple countermeasure would be to include only the expected parameters in a legacy action (again a permitted list approach, as opposed to removing unexpected parameters). And if you redirect to a URL, check it with a permitted list or a regular expression. Many web applications allow users to upload files. File names, which the user may choose (partly), should always be filtered as an attacker could use a malicious file name to overwrite any file on the server. If you store file uploads at /var/www/uploads, and the user enters a file name like "../../../etc/passwd", it may overwrite an important file. Of course, the Ruby interpreter would need the appropriate permissions to do so - one more reason to run web servers, database servers, and other programs as a less privileged Unix user. Another popular attack is to spam your web application, your blog, or forum to propagate malicious XSS. 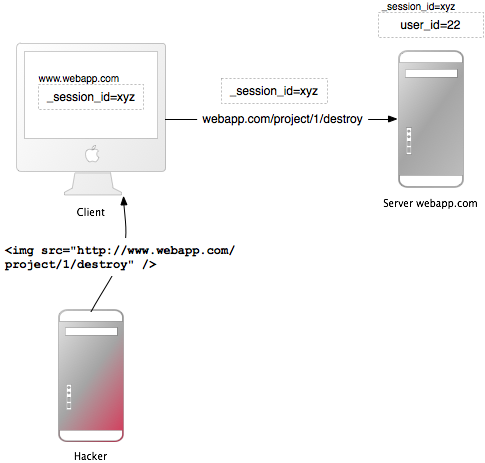 Of course, the attacker has to know the URL structure, but most Rails URLs are quite straightforward or they will be easy to find out, if it is an open-source application's admin interface. The attacker may even do 1,000 lucky guesses by just including malicious IMG-tags which try every possible combination. And thus it found the first user in the database, returned it, and logged them in. You can find out more about it in this blog post. It is advisable to update your plug-ins from time to time. Moreover, you can review your application to find more flaws like this. Injection is very tricky, because the same code or parameter can be malicious in one context, but totally harmless in another. A context can be a scripting, query, or programming language, the shell, or a Ruby/Rails method. The following sections will cover all important contexts where injection attacks may happen. The first section, however, covers an architectural decision in connection with Injection. When sanitizing, protecting, or verifying something, prefer permitted lists over restricted lists. Permitted lists are also a good approach against the human factor of forgetting something in the restricted list. Ruby on Rails has a built-in filter for special SQL characters, which will escape ' , " , NULL character, and line breaks. Using Model.find(id) or Model.find_by_some thing(something) automatically applies this countermeasure. But in SQL fragments, especially in conditions fragments (where("...")), the connection.execute() or Model.find_by_sql() methods, it has to be applied manually. The most common entry points are message posts, user comments, and guest books, but project titles, document names, and search result pages have also been vulnerable - just about everywhere where the user can input data. But the input does not necessarily have to come from input boxes on web sites, it can be in any URL parameter - obvious, hidden or internal. Remember that the user may intercept any traffic. Applications or client-site proxies make it easy to change requests. There are also other attack vectors like banner advertisements. Especially for XSS, it is important to do permitted input filtering instead of restricted. Permitted list filtering states the values allowed as opposed to the values not allowed. Restricted lists are never complete. This example, again, showed that a restricted list filter is never complete. However, as custom CSS in web applications is a quite rare feature, it may be hard to find a good permitted CSS filter. If you want to allow custom colors or images, you can allow the user to choose them and build the CSS in the web application. Use Rails' sanitize() method as a model for a permitted CSS filter, if you really need one. It is recommended to use RedCloth in combination with a permitted input filter, as described in the countermeasures against XSS section. HTTP headers are dynamically generated and under certain circumstances user input may be injected. This can lead to false redirection, XSS, or HTTP response splitting. HTTP request headers have a Referer, User-Agent (client software), and Cookie field, among others. Response headers for example have a status code, Cookie, and Location (redirection target URL) field. All of them are user-supplied and may be manipulated with more or less effort. Remember to escape these header fields, too. For example when you display the user agent in an administration area. It is beyond the scope of this guide to inform you on how to secure your application code and environments. However, please secure your database configuration, e.g. config/database.yml, master key for credentials.yml, and other unencrypted secrets. You may want to further restrict access, using environment-specific versions of these files and any others that may contain sensitive information. Rails stores secrets in config/credentials.yml.enc, which is encrypted and hence cannot be edited directly. Rails uses config/master.key or alternatively looks for environment variable ENV["RAILS_MASTER_KEY"] to encrypt the credentials file. The credentials file can be stored in version control, as long as master key is kept safe. To add new secret to credentials, first run rails secret to get a new secret. Then run rails credentials:edit to edit credentials, and add the secret. Running credentials:edit creates new credentials file and master key, if they did not already exist. Learn more about credentials with rails credentials:help. Keep your master key safe. Do not commit your master key. We don’t bump dependencies just to encourage use of new versions, including for security issues. This is because application owners need to manually update their gems regardless of our efforts. Use bundle update --conservative gem_name to safely update vulnerable dependencies.